In the latest saga of the black and blue rivalry, the UC Irvine women’s volleyball (14-2, 2-1) team successfully defended the Bren Thursday night in their Big West conference home opener, upending rival Long Beach State (5-13, 2-3) in four sets, 3-1 (25-12, 25-23, 21-25, 25-22). The victory marks the ‘Eaters’ third consecutive win over the 49ers as UCI had also come out on top in both of last year’s conference matchups. Overall, Friday’s 3-1 decision was just the ‘Eaters 10th all-time victory in their matchup against the Beach, a storied program that has hit a bit of a slump this season after finishing in first or second place in their past three campaigns. Junior opposite Haley DeSales led the ‘Eaters attack with 19 kills and a pair of aces to go along with a season-high 17 digs on the receiving end but fellow juniors Harlee Kekauoha and Idara Akpakpa also emerged with big performances of their own as Kekauoha also registered a double-double with 15 kills and 11 digs while Akpakpa had 11 kills by way of a match-high .588 hitting. With DeSales picking up her ninth game-high honor for the ‘Eaters on the year Thursday, there has not been a single match thus far this season that has been lead by a player outside of the three heavy hitting juniors, a testament to the comfort and chemistry that the trio has built with their roles on the team. The ‘Eaters got off to a dominant start, taking the upper hand over the 49ers in kills (14-6), hitting percentage (.458-.130), aces (3-0), and digs (14-4)—nearly all statistical categories—en route to a 25-12 sweep. Akpakpa got UCI going on their first major run with a kill that ignited a 7-1 run to give the ‘Eaters a reasonable lead at 8-3. As Long Beach couldn’t find any answers, failing to cut the deficit under five points for the remainder of the period, the ‘Eaters cranked the heat up and suffocated the opposition on a fiery 12-1 run to close out the set. The second set was much more of a battle as the team’s remained deadlocked for quite some time until the 49ers finally found their rhythm to earn a slight 9-7 advantage, which they went on to extend to 15-9, courtesy of a 6-0 run. The ‘Eaters, however, answered with a 5-0 run kicked off by a DeSales kill to cut the deficit to one, 15-14. Coming off the bench, 6’3’’ sophomore middle blocker Makayla Wolfe came down with a momentous kill that was subsequently followed by a successful Kekauoha slam to bring the match to draw once more at 18-18. Wolfe continued to help clog the middle, finishing the match with four total blocks (one solo block and three assisted rejections) to go along with three kills. Vying to even the match up, the 49ers tied the set up at 21 apiece but an Akpakpa block and DeSales kill gave the edge that the ‘Eaters needed to ring the set home. With a two-point advantage, DeSales rose for a thunderous slam six serves later to cap it off, 25-23. 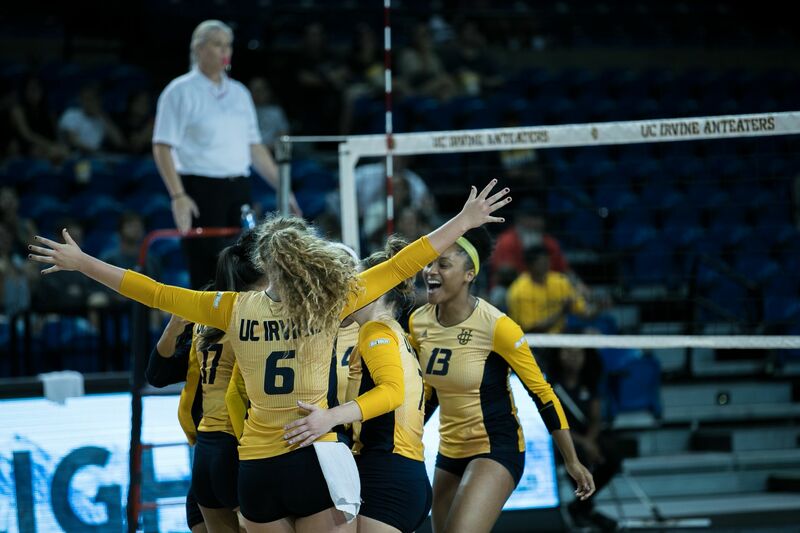 Whether it was Long Beach’s determination to avoid a sweep in the third or perhaps some complacency on the ‘Eaters end, set number three appeared to be a head scratcher for UCI. Much like how the second set had opened, both teams clawed for the some separation to start the third. After seeing eight ties, the ‘Eaters found a little spurt on a 4-0 run, which included two kills from DeSales and a monstrous block from Wolfe. A Kekauoha kill would then give the ‘Eaters a 21-20 lead. From that point on, however, the 49ers caught a surprise second wind and in a blink of an eye, scored five in a row to tie and take the set. With their chances to sweep Long Beach spoiled, the ‘Eaters came out swinging, determined to avoid drawing out the night into a five-set affair. On a period that featured a couple of kills from Kekauoha and Akpakpa along with a crowd-pleasing double block from Wolfe and redshirt freshman Danika Ferguson, the ‘Eaters went on a 12-2 run to go up 19-12. Long Beach, not one to go away that easily, were far from handing the ‘Eaters their victory. When UCI was four points from putting the match away at 21-15, the 49ers’ went on a 8-1 run of their own to knot the match up at 22. Attempting to avoid another surprise Long Beach swing, the ‘Eaters called a time-out. Out of the stoppage, UCI appeared to be the confident team that had started the match as Kekauoha lead the break with a kill that was soon followed with two subsequent points to stomp out a 25-22 decision to close out the set and game. While the trio of ‘Eaters led their team to a tough 3-1 victory over a program that has given them quite some trouble in the past, coach Hain still expressed some high expectations and areas of improvement that the three will need to work on as they continue to lead the team and progress further into conference play. “Overall, they’ve been helpful and they’ve been a big part of what we do,” coach Hain said. “Recently, just as conference started, I think that they could do more, to be honest…I was just reminding them that October is when we need them to really play well. Collectively, coach Hain also expressed a need for the ‘Eaters to remain confident and to not lose sight of the team’s identity and unity. UCI will return to the Bren to face another formidable opponent in CSUN (10-7, 4-1) tonight at 7:00pm.